The TD replaced the TC in March 1950 and was even more successful than the TC had been. In four years 29,644 were produced, including about 1700 Mk II models, and once again many were exported, 23,488 of them to the US alone. In 1952, 42 TD’s were sold abroad for every one in <?<span>Britain. The TD Midget was a combination of the best elements of several MG cars. A modified hypoid-geared rear axle was mated to the TC's drive train, all carried on the MG Y-type chassis providing independent suspension and using coil springs. This change of base chassis also meant this model now had a track of 50 inches (1,300 mm), 5 inches (130 mm) wider than it’s predecessor. Also adopted was the rack and pinion steering from the company's 1¼-litre Y type saloon. As for the looks the bodywork was based on the familiar T series lines but the soft top weather protection was much improved. One really noticeable change was the rejection of wire spoke wheels in favour of smaller 15-inch (380 mm) pressed steel disc type wheels. The lack of a fuel gauge was answered with a new light on the dash’ which would come on when the fuel level fell below 2½ British gallons (3 US gallons or less than 11 litres). Standard equipment now included bumpers and over-riders, to please the American market, and, most importantly for them, a left-hand drive option! A contemporary road-test report of 1950 described the new TD as "most striking", the changes having resulted in a "transformation...in the comfort of riding". Later in 1950 a MKII version was introduced (primarily with the export markets in mind) to run alongside the standard car. It featured a more highly tuned engine with an increased compression ratio of 8.0:1, this improved the power output to 57 bhp (43 kW) at 5500 rpm. Twin fuel pumps would also have helped even the fuel flow, while revised dampers and a higher rear-axle ratio helped the sporty feel of the car. 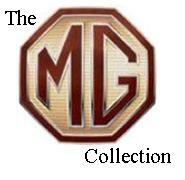 Behind the scenes the formation of the British Motor Corporation, in 1952, was about to have an impact on the MG marque. BMC was the result of merging the Austin and Morris companies, inheriting other brands, such as MG, Riley and Wolseley, too. The launch of the Austin-Healey 100 hit sales of the MG TD heavily but Leonard Lord, in his capacity as Chairman of BMC, decreed that MG should not introduce a new model in 1953. He reasoned that the newly formed BMC did not need two new sports cars. This model was built straight from the box around 1960. It is painted with Humbrol enamels all applied by brush. Rod was not that long into his modelling career when this model was built as he progressed to adding clear acetate windscreens and lamp lenses to his cars by the mid 1960s. Aurora released this kit in 1958 and for the time it was a nice kit featuring real rubber tyres, one of the earliest kits to do so. It is generaly basic in style reflecting the moulding technology of the period. The kit lacks are clear parts, which was not unusual for the time, clear plastic was very expensive and very brittle back then. Aurora would have been mindful of both the cost and the possibility for complaints. Gowland and Gowland, Revell and Champion all released the MG TD in 1/32nd scale but none of their kits had the same refinement or rubber tyres.